Directly in front and to your left, Confederate Maj. Gen. Robert F. Hoke’s division, on loan from the Army of Northern Virginia, blocked the old Goldsboro Road (now Harper House Road) to deflect the oncoming Union advance. The division was a mixed bag of veterans of Gettysburg and Cold Harbor, “Red Infantry” (artillery units from Fort Fisher and other coastal forts who served as infantry during the battle), and teenage boys formed into three regiments as a last-ditch Southern effort. seize the moment, doomed Southern efforts. - William Kemp, 98th Ohio. - Capt. Herman Lund, 16th Illinois. - Lt. Col. Alexander C. McClurg, chief of staff, Union VIV Corps. 35° 18.886′ N, 78° 17.975′ W. Marker is in Bentonville, North Carolina, in Johnston County. Marker is on Harper House Road (County Route 1008), on the right when traveling east. Touch for map. Marker is in this post office area: Four Oaks NC 27524, United States of America. Touch for directions. Other nearby markers. At least 8 other markers are within walking distance of this marker. 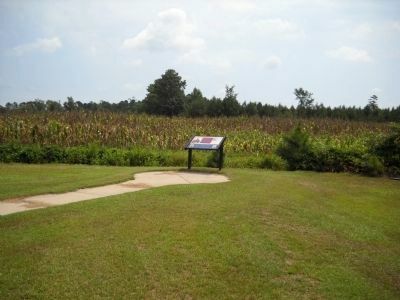 First Union Attack (within shouting distance of this marker); Fighting South of the Goldsboro Road: The “Bull Pen” (within shouting distance of this marker); Fighting at the Cole Plantation: The “Battle of Acorn Run” (within shouting distance of this marker); Cole Farmhouse (within shouting distance of this marker); Fighting Below the Road (about 500 feet away, measured in a direct line); Main Confederate Line (about 700 feet away); Bentonville (approx. 0.2 miles away); Confederate North Carolina Junior Reserve Line (approx. 0.2 miles away). Touch for a list and map of all markers in Bentonville. More about this marker. 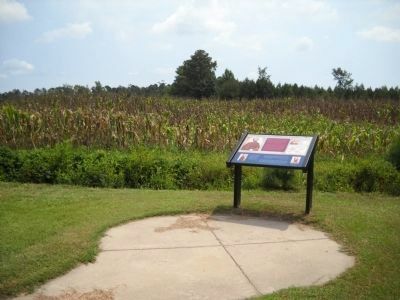 The top of the marker features a photo of Gen. Braxton Bragg, commander of the Department of North Carolina (from Valentine Museum) on the left, and a photo of Pvt. 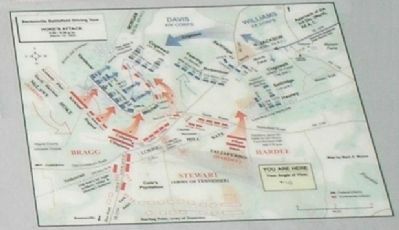 James Dallas Croom, Company B, 1st Battalion, North Carolina Heavy Artillery (from James McCallan), and a battle map of Hoke’s Attack on the right. On the bottom section of the marker has a photo of Union Lt. Col. Alexander C. McClurg (from U.S. Army Military History Institute) on the left, a photo of Confederate Maj. Gen. Robert F. Hoke, commander of Hoke’s Division, Army of Northern Virginia (from U.S. Army Military History Institute). 2. Roadside Exhibits at Bentonville. 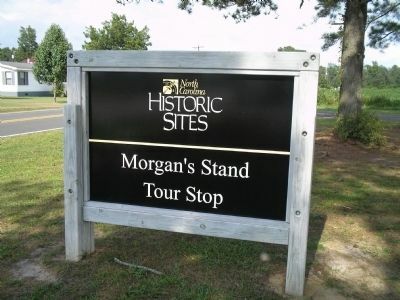 The Confederate Line Crossing the Goldsboro Road Marker is one of three markers located at the Morgan's Stand Tour Stop. More. 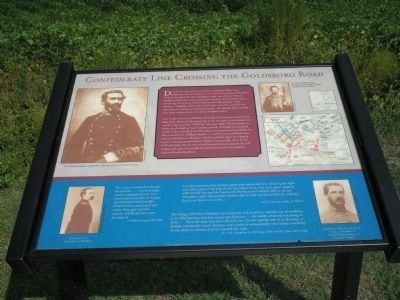 Search the internet for Confederate Line Crossing the Goldsboro Road. Credits. This page was last revised on June 16, 2016. This page originally submitted on March 2, 2008, by Bill Coughlin of North Arlington, New Jersey. This page has been viewed 1,563 times since then and 20 times this year. Photos: 1. submitted on March 2, 2008, by Bill Coughlin of North Arlington, New Jersey. 2, 3. submitted on August 12, 2010, by Bill Coughlin of North Arlington, New Jersey. 4, 5. submitted on March 2, 2008, by Bill Coughlin of North Arlington, New Jersey. • Craig Swain was the editor who published this page.